There are real people out there who, when given a packet of crisps, actually look at the expiry date and note the day of the week it falls on. My greasy salty hands can barely hold onto the crisp packet once I’ve torn into it, but these sad observant souls are plagued by the question of why they always expire on a Saturday. Well Walkers have finally cleared up the time stamp that has tormented so many, saying it is simply down to their production week. On a side note… Gary has definitely gotten better with age, what’s going on with that bowl cut? It turns out that their production week starts on a Sunday so all products made that week will have the same Best Before date of a Saturday because it is the last day of their week. @walkers_crisps I've been baffled for a while. Why are all you're 'best before' dates on you're crisp products always fall on a Saturday???? I wish I was joking, but there is in fact a Facebook page called ‘ALL Crisps Go Out Of Date On A Saturday, FACT’. 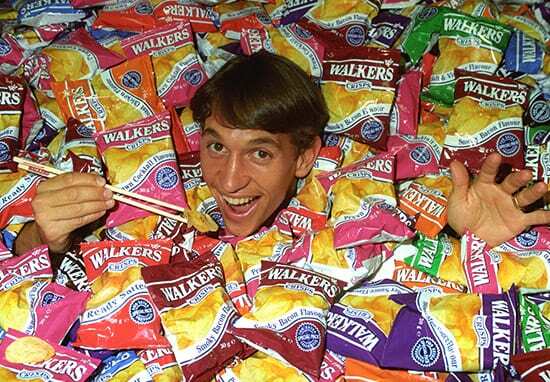 The Leicester crisp maker has finally put everyone’s mind at ease…we can sleep peacefully once more.